Make yourself comfortable at this oceanfront hotel between St. Petersburg and Clearwater. Well-appointed guest rooms feature private furnished balconies, mini-fridges and 40-inch flat screen TVs. Choose a gulf view room for spectacular sunsets and calming ocean views. Swim in the outdoor pool or try water sports at the semi-private beach. Enjoy a meal at Mangos beachfront restaurant or on the outdoor veranda savoring the freshest seafood, steaks and Floribbean cuisine or sip an exotic cocktail at the Tiki Bar, directly on the beach. 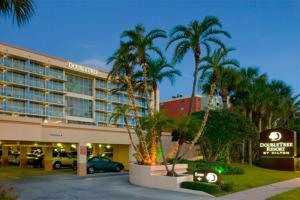 This hotel is 16 miles from St. Petersburg-Clearwater International and 23 miles from Tampa International Airport.